2. Add the bay leaves, ginger paste and panch phoran. 3. Fry for a few seconds. 4. 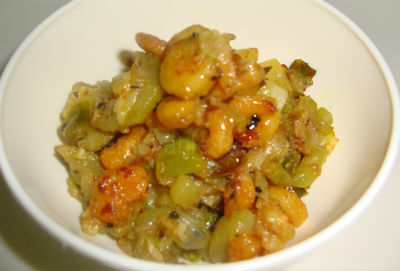 Add the bottle gourd and cook till tender. 5. Now add the shrimps and stir-fry for a 45 seconds. 6. Add the red chilli powder and 1/2 cup of water. 7. Increase flame to high and cook till all water evaporates. 8. Keep stirring often and remove. Feel free to comment or share your thoughts on this Lau Chingri Recipe from Awesome Cuisine.